In the absence of a Milan game to write about, I won't focus on any particular topic for this post. Instead, you're getting the same thing you would get if you asked any given Serie A club owner about football. A rant. Since the players are on strike, I am too. Except I showed up for the game and I don't make millions of Euros a year, like millions of other disappointed fans across the world. Stadiums all around Italy are empty this weekend when they should be packed full for the first round of the season. Not that they'd be full anyway, unlike their counterparts in Germany. Speaking of the Bundesliga, I recommend fighting your football starvation with the game Leverkusen-Dortmund which is today at 06:30. Tomorrow you could go for a bit of Premier league with the most interesting games on the schedule being Tottenham-Man City at 01:30 and Man Utd-Arsenal at 05:00. If you want to fill the slot that should have been filled with the game between Udinese and Juve, you can watch French champions Lille take on Marseille at 09:00. All times are Italian times, for your convenience since you're used to converting calcio time to your respective timezones. In the words of Homer Simpson, going cold turkey isn't as delicious as it sounds. There's always football to be watched somewhere. Last night, Porto gave Barcelona a run for their money. At least in the first half, until a tragic error from Guarin, Barca had only two shots on goal. The referee, who was there because he's the delegate's neighbor believe it or not, was atrocious, making several critical errors on both sides, most notably not allowing a Barca 2-on-1 counterattack for no reason and not giving a clear penalty to Porto while the result was 1-0. Milan's Mister X came on near the end and scored the second goal for Barca, effectively killing off the game which ended with two deserved red cards for the frustrated Portuguese players. 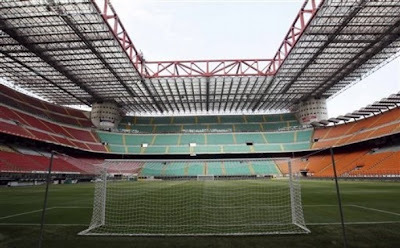 Because of the strike, Milan will only have one competitive game before playing the toughest game in the world - after playing Lazio two weeks from now, the rossoneri travel to Catalonia to take on Barcelona on their home ground. But as long as the two groups of multimillionaires who are playing tug of war with an army of fans across some table in Rome are happy, everything is peachy. Taiwo and Flamini won't be fit but the rest of the team should be there unless any new injuries occur during the international break. Flamini is out until January, apparently, which leaves us very thin in the midfield area, with Ambrosini as the only real substitute for van Bommel and Gattuso. I can't help but hope Galliani is working on signing someone, even if that someone is an average Serie A player who can fill in on occasion when injuries and a tight schedule call for such measures. And I'm done. More on Serie A when there's Serie A being played. In the meanwhile, enjoy what football you can find across the continent and try not to get too frustrated about the strike.